My dear friend Sam Cunningham of Cunnington Farms and I have often over the last few years swapped sheep back and forth. Before I went to Ohio with her (yes, Sam is a 'her') I took a ram she had sold my daughter and I in 2004. We were going to trade a moorit CVM ewe lamb. 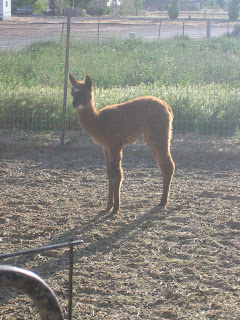 While we were gone, Sam's alpaca/guanaco had a cria and then the next day, the guanaco had one! They are the cutest things! 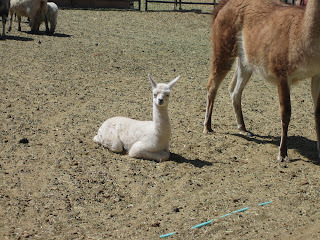 This one was the first to be born, she is half alpaca and half guanaco. This was the second one born, on Sunday the 25th I believe, also a girl. After we got home and got to wander through the pens and see all the wonderull fibery animals, we realized that the moorit ewe lamb had hangy-downy parts; she was a he. I am trying really hard to keep my flock focus on the tunis and Jari's 4-H sheep, and I really fought with myself about having another wool sheep on the farm, but she was a moorit! I couldnt resist until we found out she wasnt a she. The ram lamb was easy to decline, since I dont have any wool sheep to breed him to. Then Sam said "Would you like a guanaco?" I know my eyebrows went up and my mouth fell open because she said "one or two more sheep and it would be a trade!" I think I stuttered for a minute. Have I mentioned I love Sam? She is one of the sweetest most giving people I have ever met, but I can tell you right now, she is getting more than 3 sheep out of me for that little girl! They are priced a lot like alpacas and Im thinking if we make this trade, Im in for at least 10 sheep! You reading this Sam? It is in black and white now! Is this the Sam who recently posted to the TunisTalk list? If so, she sounds like a real gem. I wish I lived closer, because I'd love to meet you both in person! It sounds like you're getting quite a menagerie. I won't be jealous until you write about getting some Navajo churro sheep, though, as they were actually my first choice conservation breed, but I didn't find any around here until I had already gotten my tunis and karakuls. I wont be getting churros anytime soon, but it wouldnt be hard if I decided to as Sam has been raising them for years. Oooh, next thing now will be breeding alpacas. When will you sleep??? Heh, heh, heh. Have I got a deal for you!! I have a moorit Romeldale wether... You know that all CVM's are romeldales, but not all romeldales are CVMs? CVM, or as we call it, badger pattern sheep (grey or moorit - they aren't mutants) are only a color pattern of the Romeldale breed. So romeldales come in black, brown/moorit, grey badger, moorit badger, white, spots, and pretty much any combination of the above. So, how 'bout it? He's out in the pasture getting fat as a tick on good Oregon grass!! Isn't it nice to have good friends?